Linus Van Pelt: Sure, Charlie Brown, I can tell you what Christmas is all about. Advent calendars are awesome – it’s a festive way to countdown the days until Christmas – and ones with treats to enjoy on each day leading up to the Big Day are super fun. But several years ago, I was introduced to the concept of combining a Jesse tree with the advent season, and reading about the lineage of Jesus – a passage each day of advent – leading up to Christmas. 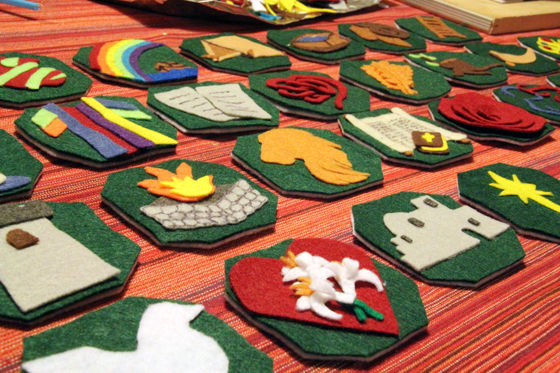 It’s a very cool way to see how the different people and stories are linked in the Bible, and after making our “alternative tree” out of felt this year, I thought making a Jesse Tree Advent calendar – with little felt ornaments representing each day/story – would be a fun project. 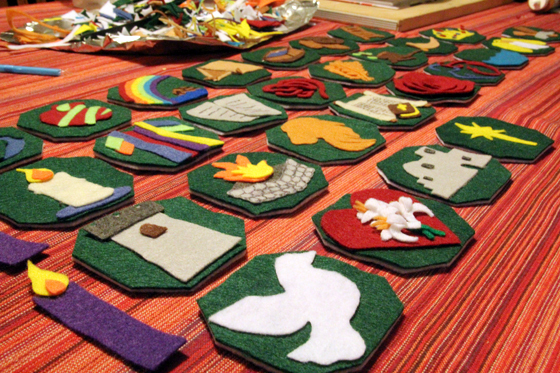 I started out by looking for examples of Jesse Tree advent projects that were out there online. 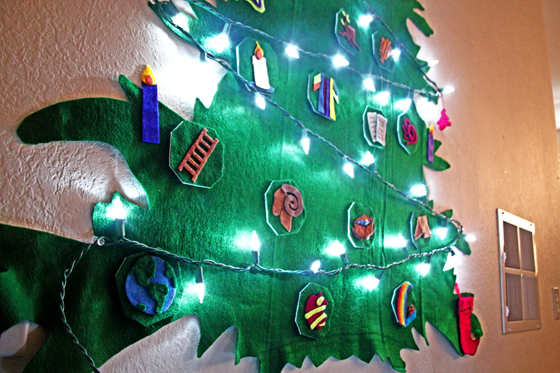 I found an awesome Jesse Tree Advent project from TiredNeedSleep.com (thanks so much, Nicole!) that not only outlined a theme and passage for each day, but also included an image for an ornament as well. I started with the ornament of the earth – unfortunately when I started the project, I only had a neon green besides the one we used for the tree, so I had to use the same green for the continents. This one was trickier than I thought it would be – I couldn’t see pen marks on the felt to try to draw the land shapes so I could cut them out. I ended up having to free-hand cut. That considered, I was pretty happy with how this one turned out. 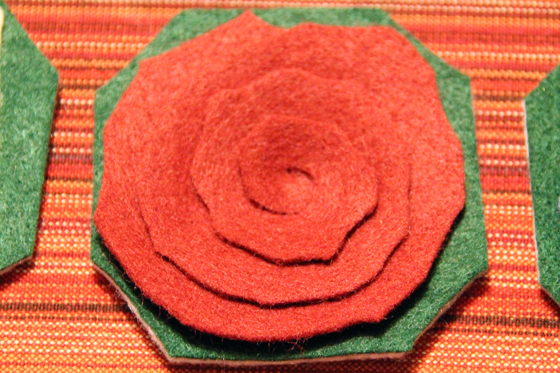 Some of the other notable ornaments were this rose (this was the project I was writing about in the “felt rose” post!) – I had never known how to make these and they’re super easy, quick, and yet really cool looking! This was a tough one – the story was “Zechariah and Elizabeth” who were the parents of John the Baptist long after they were supposed to be able to have children. 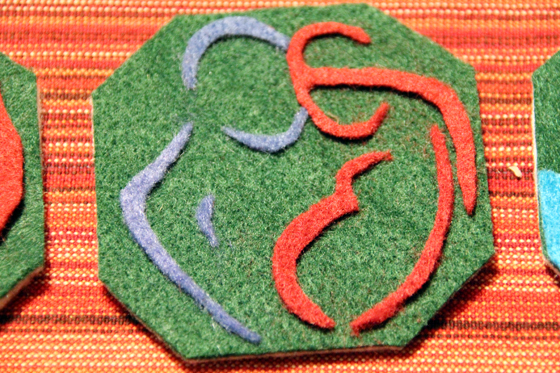 The original ornament seemed too complex for me to be able to recreate the details in felt, so I thought of just doing a simple “man and woman” silhouette type thing, when I found a really artistic “family symbol” that I liked. 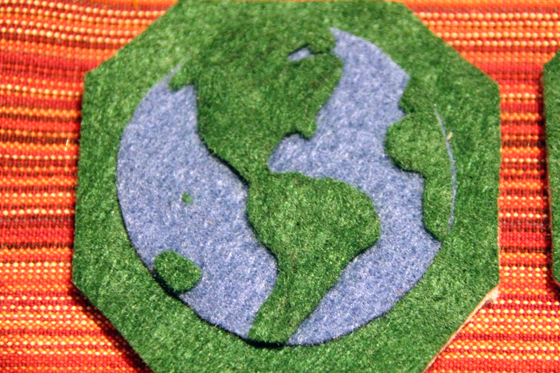 Free-hand cutting THIS out of felt was not easy for me – but I think it ended up looking pretty good. 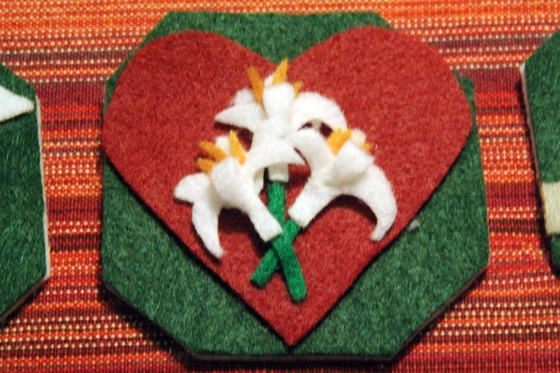 Another challenging one was Mary’s – the symbol was a heart with lilies. I was pretty sure I wasn’t going to be able to accomplish this one, but I had to try to figure something out. Again, I scoured the interwebs to find more examples of lilies – and finally I thought I’d try to do a kind of half 3D version of them. I cut a “background” petals piece and a “foreground” one, where I folded back one of the petals, and used little slivers of goldenrod for the stamens. I really like how this one ended up turning out. When I was finally done, it was great seeing all the ornaments laid out, in order of their placement during the month. The project I followed made 28, which is the largest amount needed for any given advent season (based on the four Sundays before Christmas, not just days in December – advent can start as early as November 27!). This advent season only has 23 days, so I’m doubling up on passages and ornaments for each Sunday, except for the first (basically following Nicole’s schedule). This project was a bit of work, but I’m really glad I decided to take it on – the ornaments are filling up our new tree nicely, and adding lots of great color and interest along with the awesome ones made by people who have come to visit. This is a great, fun, and special way to celebrate the season. All the pieces are so well done…the lilies are gorgeous!